SPECIAL OFFER - BUY 10 Rolls @ £39.50 each +VAT ! DALTEX® Dalpro® is a 3-layer low resistance, vapour permeable air barrier roofing underlay felt, which resists the penetration of air into a roof structure. It is a semi-permeable polypropylene composite sarking felt, manufactured in the UK to the highest standards under the ISO 9001 quality system. Daltex® Dalpro® Roofing Felt allows the ready transfer of moisture through the underlay, thereby reducing the risk of condensation in roofs. In warm pitched roofs and UK cold pitched roofs, when Daltex® Dalpro® Roofing Felt is installed, there is no need to ventilate the roof space, providing the fabric is installed in accordance with the relevant Agrément Certificate instructions, as the vapour permeability allows moisture to diffuse through the underlay. Daltex® Dalpro® Roofing Felt is suitable for fully supported or unsupported roofing applications, and can also be used in conventional ventilated roof construction. Daltex® Dalpro® Roofing Felt has optimum flammability resistance, complying with Class D of European Standard EN 11925-2. It is durable, flexible & lightweight allowing for easy installation, and offers temporary protection against wind driven rain, snow & dust. 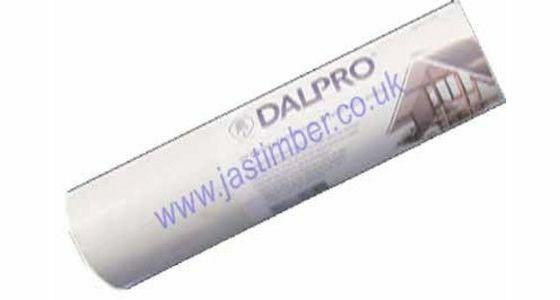 Daltex Dalpro Roofing Felt is only £45.00 (+ vat) per Roll or £39.50 (+ vat) for 10 Rolls.